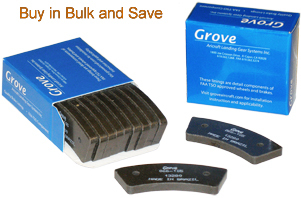 Always use Grove brake pads with Grove wheel and brake products for maximum performance. They have undergone rigorous testing for FAA-TSO approval and are FAA-PMA approved for installation on certified aircraft. Save time and hassle with pre-assembled brake pad assemblies. Assemblies come ready to install. Just remove the old worn assembly and replace it with a new one.